Today I have another card for the Coffee Lovers Hop. The base of the card is made with Watermelon Fusion Cardstock and Spring Parade pattern paper. I then added some Cool Pool Satin ribbon to make the stem and leaves of my flower. Next I added a Watermelon Fusion Doily on top. I then took the heart "steam" from the Enjoy Coffee set and stamped it in a circle with Watermelon Fusion ink on Whip Cream Cardstock to create the flower. I added one with foam squares and added Journey Glaze and Journey Sparkle Dust. I then stamped on a scrap piece of Whip Cream Cardstock and I stamped the tea cup from the Enjoy Coffee set in Hazelnut Blend Ink. I fussy cut this out and used foam squares to add it to the center of my flower. I added some Journey Glaze to make it pop. To finish the card, I then stamped the sentiment from Cozy Wishes (set not available for purchase yet) in Hazelnut Blend Ink on Whip Cream Cardstock, cut a banner in the one side and attached to the card. Enjoy! I love the flower petals shaped like hearts! Adorable! The doily is the perfect addition! 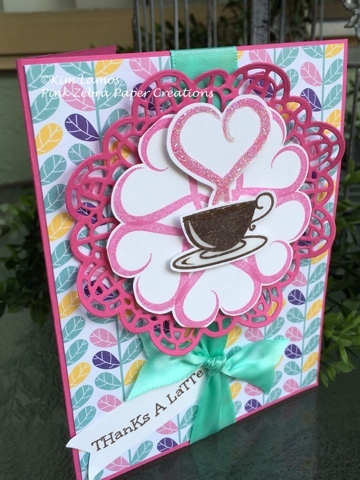 Love the bg paper, hearts and the doily! Beautiful! Love the watermelon fusion color - so rich & pretty! Love how you made the circle of hearts/steam. Love that Watermelon Fusion, so pretty. Cute card. Love the way your used the swirling hearts for the steam. Great colors and design papers. Very pretty card. So elegent and cute card. Very pretty card, Kim! Have a Happy Friday and Happy Hopping! Well, this is awesome! I LOVE your ribbon "stem"... I LOVE the doily and LOVE the flower made out of steam hearts... very very cool! What a pretty spring card! Love the colors and the awesome detail you've added! How clever, love your pretty flower! Love what you created with the coffee steam. Perfect decoration behind the cup. What a cool circle of hearts! LOVE your PRETTY layers and colours, a FABULOUS design!! !